Virginia had posted this on my page. Just imagine renovating your house and you find tunnels attached to it. It can happen everyday in Salem. It could happen in your house! One guy in Turkey in 1969 did just that. Not only did he find a tunnel behind the wall, but an ancient city that delves 18 stories underground. Salem deepest basement only goes 4 stories under the East India Marine Hall ! 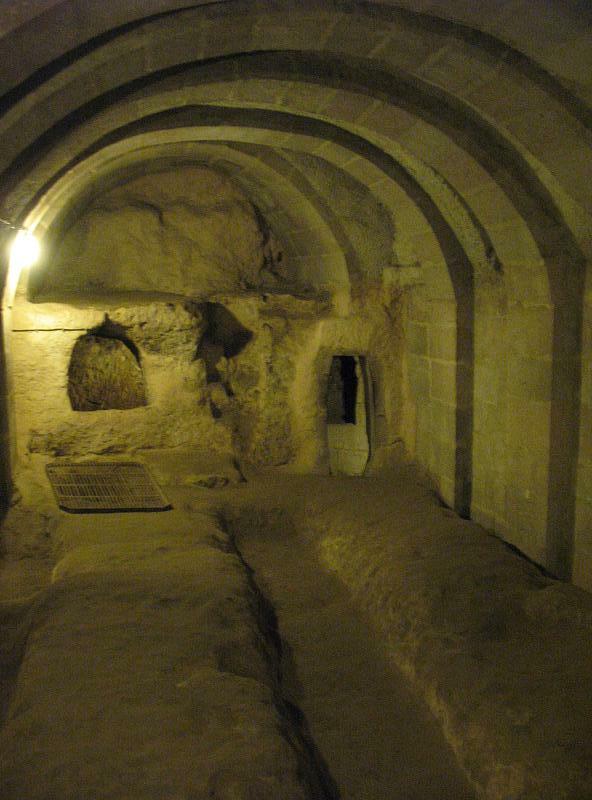 The underground city at Derinkuyu could be closed from the inside with large stone doors. 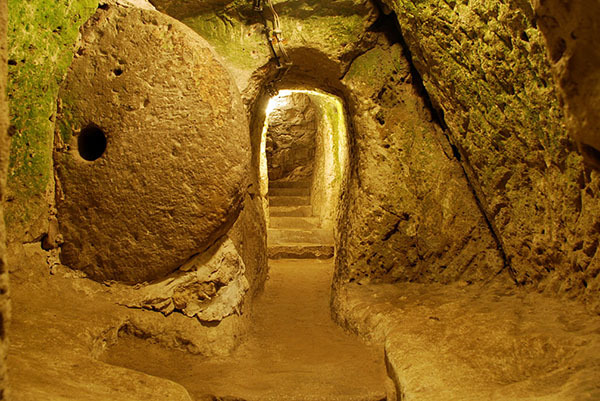 Each floor could be closed off separately.The city had all the usual amenities found in other underground complexes across Cappadocia, such as wine and oil presses, stables, cellars, storage rooms, refectories, tombs, and chapels. Unique to the Derinkuyu complex and located on the second floor is a spacious room with a barrel vaulted ceiling. It has been reported that this room was used as a religious school and the rooms to the left were studies. Between the third and fourth levels is a vertical staircase. This passage way leads to a cruciform church on the lowest (fifth) level. First built in the soft volcanic rock of the Cappadocia region, possibly by the Phrygians in the 8th–7th centuries B.C. according to the Turkish Department of Culture, the underground city at Derinkuyu may have been enlarged in the Byzantine era. During the Persian Achaemenid empire the city was used as a refugee settlement. There are references to underground refugee settlements built by the Persian king Yima in the second chapter of the Zoroastrian book Vendidad. Therefore, many scholars believe that the city may have been built by the Persians. 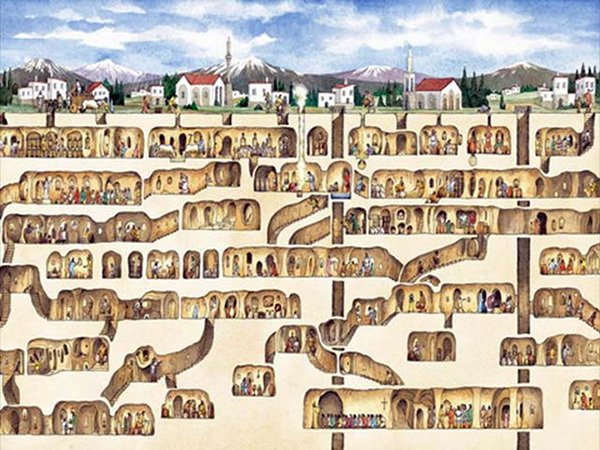 The city was connected with other underground cities through miles of tunnels. Some artifacts discovered in these underground settlements belong to the Middle Byzantine Period, between the 5th and the 10th centuries A.D. The large 55 m ventilation shaft appears to have been used as a well. The shaft also provided water to both the villagers above and, if the outside world was not accessible, to those in hiding. The tunnels were rediscovered in 1969, after a resident of the area found a mysterious room behind a wall in his home. Further digging revealed access to the tunnel network.Just imagine if you call in our team of tunnel experts with our small jackhammer what world you might find on the other side of your basement wall. There is rumors that the tunnel extends up Highland Avenue to Lynn, maybe not…but along the North River to the Crowninshield Tanneries in Peabody, possible. If you have stories or think your home is connected to the tunnels, drop us a line at info@salemtunneltour.com and we might add your house to our new book on the tunnels. Or we might add your story to this blog! Like the story of the woman who bragged about the food she cooked when in all reality her neighbor would cook it and smuggle it to her through the tunnel without anyone knowing! Share your stories! New Tunnels on Oliver Street! The Searle House. Searle was a housewright and his home was built in 1811. His tunnel goes under the fireplace arch closest to the street. There was also a wooden raised platform with the hot water heater on it. It could of been hiding an access to a subbasement. Many homes like the Hodges on Essex and Orange Street or Rockefellas has a subbasement. Look for updates on this house. Other homes just found is the old Derby Square Bookstore and the Crombie Tavern on Crombie Street. Look for these posts too. Jean M. Missud died in 1941, but some still hear his music today in the Salem Common. Jean Missud (1852-1941) was the long-time director of the highly acclaimed Salem Cadet Band, which he directed for 63 years, setting a national record for band longevity. The talented Missud was born in Nice, France in 1852. After showing aptitude for music at an early age, he played clarinet in the USS Sabine’s ship band. His naval career was brief, and after arriving in Boston in 1870, he left the navy to pursue a career in music. The Salem Cadet Band featured woodwind, brass and percussion instruments. It grew from the dozen original members in 1878 to close to 30 members by 1900. For 25 years it was the official musical organization for the Ancient and Honorable Artillery Company of Boston. Locally they played regularly on the Salem Common and the Salem Willows. Hamilton Hall on Chestnut Street was another frequent venue, providing music for Salem Assemblies, playing a mixture of waltzes, two-steps and lanciers. They also toured major cities and Canada quite regularly. On foggy nights many citizens walking pass the bandstand, which was dedicated to him in 1976, still see his band playing. For many years people have commented on seeing this group of performers play through the veils of time. So take a walk this summer late at night and pause at the bandstand, you might just hum a few bars of his ghostly music. The Salem Tunnel Tour Listed on Fodor! We have been listed on their site of the top 12 offbeat tours throughout the Country! Fodor Top 12 Offbeat Tours! Abel Lawrence hds many ties to Elias Hasket Derby Junior and the tunnels built throughout the town. Lawrence had owned ships with his father, was commander of the Salem Cadets who helped dig the tunnels, and was the fifth master of the Essex Lodge of Masons. Elias was the 3rd Master of the Lodge and also commanded the Salem Cadets. Plus Lawrence was a member of the Salem Commons Improvement Fund which Derby had put together to disguise his tunnel project. Abel Lawrence had lived in this building and ran his distillery here. In 1817 the rear ell was added to the building. Then in 1822 after his death his kids tore down the front section on Washington Street which housed the distillery and had it rebuilt. Over the years the Salem Athenaeum and the Essex Historical Society that was founded by another Salem Commons Improvement Fund subscriber, Edward Augustus Holyoke, resided in the building . In all of the previous locations in which these institutes resided there were tunnel entrances. Plus Holyoke’s daughter had married Joshua Ward who lived across the street on Washington Street. At the time of its construction the building resided on the South River across from Joshua Ward’s wharf on the location of the old Salem News building. So now to the pictures. below you will see the various sealed entrances from the tunnels into this building. Enjoy!